The Deltoid ligament (or the medial ligament of talocrural joint) is a strong, flat and triangular band. It is attached above to the apex and anterior and posterior borders of the medial malleolus. The Deltoid ligament is composed of superficial and deep components. The deltoid ligament attaches the medial malleolus to multiple tarsal bones. Unlike the superficial layer of this ligament, the deep layer is intraarticular and is covered by synovium. Anatomically, in general, the superficial components arise from the anterior colliculus of the medial malleolus, and the deep components arise from the intercollicular groove (malleolar groove) and the posterior colliculus of the medial malleolus. The superficial deltoid originates from the anterior & inferior aspects of medial malleolus fanning out & sending 3 bands to navicular and along plantar calcaneonavicular (spring) ligament, to sustenaculum tali of calcaneus and to medial tubercle. It is also partially covered by tendon sheaths & crural fascia. 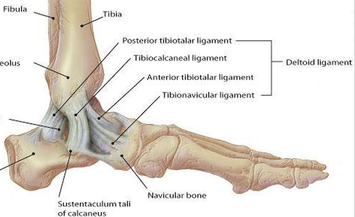 It primarily resists eversion of hindfoot; Tibionavicular portion suspends spring lig & prevents inward displacement of head of talus, while tibiocalcaneal portion prevents valgus displacement. The deep deltoid originates on posterior border of anterior colliculus, intercollicular groove, & posterior colliculus. It is oriented transversely & inserts into the entire nonarticular surface of medial talus. Deep deltoid extends the function of the medial malleolus, prevents lateral displacement of talus & prevents external rotation of the talus (this is mostly significant in plantar flexion, when deep deltoid tends to pull talus into internal rotation). In neutral evaluates superficial deltoid ligament complex. 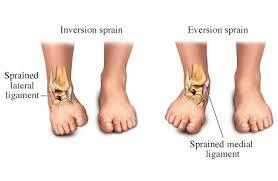 To avoid ankle sprains, or ankle instabilities we have exercises to enforce or train the medial ligaments of theankle. 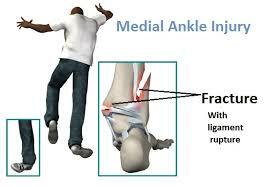 Those ligaments are important to avoid an eversion of the ankle (eversion trauma’s). Otherwise we have exercises that are used after ankle sprains or ankle instability. First and second degree sprains are typically managed with conservative treatment. This conservative treatment consists in de early stages of RICE (rest, ice, compress, elevate) and mobilization to prevent range of motion loss. When pain and inflammation are controlled, we can start with therapeutic exercises to increase the range of motion stability, strength proprioception and function. For the third degree there has to be surgical treatment to resolve the structural damage. After this surgery, the ankle is immobilized. If there is pain or oedema after the immobilization, this has to be treated first before starting the conservative treatment, which is the same as for the first and second degree. This exercise can also be done without the resistance of a physiotherapist. The subject takes place on a chair. He puts an elastic tubing around his foot, and puts his other foot on the elastic tubing. He holds the elastic tubing in his contralateral hand. Then he has to perform the same exercise as with the therapist. He has to push his foot outward, with his footpad away from the midline of his body. We can start exercises for proprioception after 5 weeks when started physiotherapy. The next exercise had to be done in stance. First they had to stand flat floor and then on a balance board. The subjects had to stand on one leg on the floor, first with their eyes open and thereafter with their eyes closed. Each exercise had to be done 3x15 times. After this exercise the subject had to stand with both feet on a balance board or wobble board. They had to make circular movements to train eversion, but also inversion, dorsiflexion and plantar flexion. To make these exercises more difficult we could vary the surfaces, on the floor, a balance board, and an instable underground. Another way to increase the difficulty was to open or close the eyes while performing the exercises. The physiotherapist could also increase the exercise by giving light perturbations while the subject balanced on the balance board. ↑ Wolfe MW, Uhl TL, Mattacola CG, McCluskey LC. Management of ankle sprains. Am Fam Physician. 2001 Aug 1;64(3):386. (level of evidence 3A)fckLRUrl: http://www.aafp.org/afp/2001/0101/afp20010101p93-f4.jpgfckLR Brand RL, Collins MD. Operative management of ligamentous injuries to the ankle. Clin Sports Med. 1982 Mar;1(1):117-30. ↑ Brand RL, Collins MD. Operative management of ligamentous injuries to the ankle. Clin Sports Med. 1982 Mar;1(1):117-30.